About: 5 Star is the stars choice when they want to ensure everything is all white on the night. We have been established for over 40 years and our high level of service has meant that our customers expect nothing but the best from us. Altaf Ahmed, owner of 5 Star Dry Cleaners has seen everyone from Cherie Blair to Stephen Fry come through the door over the past 40 years. "When I first opened we had a lot of members of the local Adams family and their acquaintances come in and now we also have a lot of judges and barristers coming in like the Lord Chief Justice, Lord Woolf so we have a diverse clientele to say the least! We also have quite a few newscasters like Jon Snow and Adam Bolton from Sky." Other famous faces who have made an appearance to 5 Star are Linda Robson (Birds of a feather), Joe Swash (Easterners), the boxing promoter Frank Warren, and Margaret Hodge (Labour MP for Barking). The business has been recommended as the place to get your Dry Cleaning done in London in the Independent's style column and by the Evening Standard. *We also have a unique 24 hour pick up service where you can pick up your garments at any time. Come in and try on your garments and our expert tailor will pin them up to your satisfaction, as soon as your garments are ready, we shall call you for a final fitting and only when you're happy with the fitting, we will finish the job. Great service, always looking to go the extra mile and suggest ways to save money rather than exploit. Would not go anywhere else. Lost my very pricy brown leather blazer, attempted to blame me for not picking up the order on the day they suggested although it was clearly a mistake on their own behalf. Apart from that quality is not too bad but losing customer clothes is a definite no go thanks. Excellent service! Took an extremely expensive dress with a stain to get cleaned, was quite reluctant at first as I didn't want it getting ruined anymore than it was...thinking that it'd only get worse. Glad I went to 5 star! brilliant cleaning and an even better service. THIS DRYCLEANERS IS AMAZING! THEY CAN GET ALMOST ALL STAINS OUT OF ALMOST ANYTHING!!! THEY PROVIDE A NEXT TO NONE ALTERATION AND REPAIR SERVICE AND THE BEST THING IS THEY PROVIDE QUALITY WITH SPEED. THE CUSTOMER SERVICE IS UNBELIEVABLE AS THEY ACTUALLY DO THEIR UTMOST BEST TO CATER TO YOUR NEEDS (WHICH IS VERY UNCOMMON IN TODAYS WORLD) I TOOK A SUIT IN TO THEM WHICH WAS FULL OF RED WINE AND THEY WERE VERY REASSURING. NEEDLESS TO SAY MY SUIT CAME BACK AS CLOSE AS IT COULD TO BRAND NEW. THEIR PRICES ARE ON THE HIGH SIDE BUT ITS DEFINATLY WORTH EVERY PENNY ESPECIALLY WITH EXPENSIVE AND DELICATE CLOTHS. THEY ALSO DO SHOE REPAIRS AND WEDDING DRESSES AND THE TAILOR IS A GENIUS! HE EVEN FIXED THE ZIP ON MY HAND BAG! I THINK IT IS A FAMILY BUSINESS AND THE ELDERLY GENTLEMAN IS A TRUE PROFESSIONAL AND KNOWS HIS STUFF! THE YOUNGER HANDSOME MAN WITH THE BLACK BEARD AND OMAR SHARIFF LOOKS IS SUPER POLITE AND IS VERY HELPFULL, HE IS THE KIND OF PERSON I WOULD LOVE TO HAVE WORKING FOR ME, HES A COMPLETE GOD-SEND (AND A VERY SNAZZY DRESSER! I HAVNT SEEN A RING ON HIS FINGER SO I MAY BE IN LUCK!) THERES NO SUCH THING AS A 'BIG ASK' IN THIS SHOP! I THINK FIVE STAR HAS BEEN AROUND FOR ABOUT THIRTY YEARS OR SO, AND THEY ARE PROOF THAT EXPERIENCE DOES COME WITH AGE! this dry cleaning shop provides by far the greatest service i have ever known to receive. The customer service is very friendly and efficient. 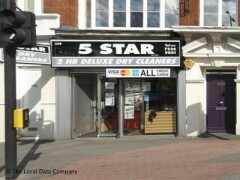 Although prices are rather pricey in comparison to other dry cleaning shops all in all the service is worth every penny. Highly recommended.